I like how bright the little yellow bike looks with the understated surrounds! Ginnie Hart: Thanks, Elizabeth. 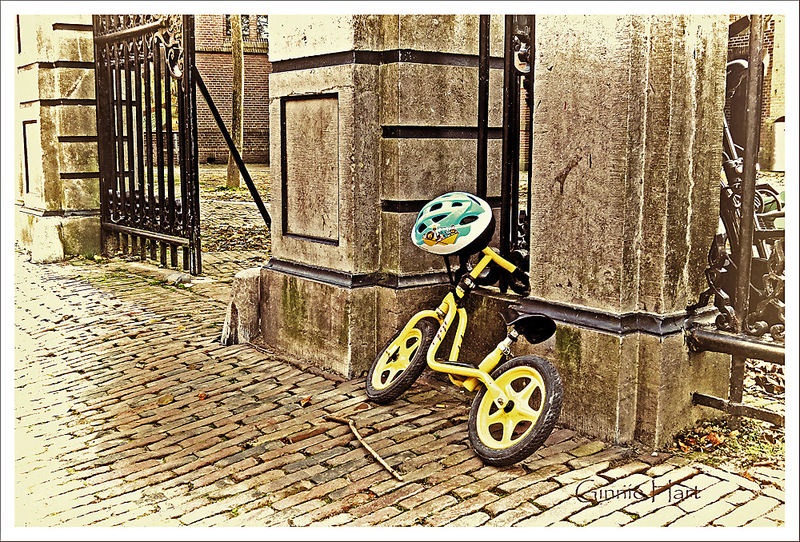 For some reason, I am quite attracted to these kids' bikes all over the Netherlands! Someone has made off with the pedals and cranks! Ginnie Hart: The way the kids handle these pedal-free bikes always amazes me, Ray. Où sont les pédales ? Ginnie Hart: The Dutch kids don't need pedals, Martine!!! Ginnie Hart: Oh, yes. Flying around with their helmets on! Ginnie Hart: I had no idea there was a name for such a bike...but then, leave it to the Dutch. I love watching the kids zoom around on them, and then parking them like the big guys! How do they propel them forwards, Ginnie? To Lisl: using only the feet - he is just learning to ride a bike. Ginnie Hart: Who knows where he/she might be, Philine, but I always smile when I see such a bike parked somewhere. Ginnie Hart: Oh, no, Chris...for going EVERYWHERE. They learn young...and have no idea how lucky they are that Holland is, for the most part, flat! I love your treatment here! Ginnie Hart: Thanks, Richard. I suppose Alan started out on one of these??? Such a bike give sthe rider confidence in how to balance and of course can be helped by the occasional dab of the foot if it starts going wrong Pleased to see a helmet will be used. Ginnie Hart: I have a feeling you started out on one of these, Alan...assuming they were around back then??? Ginnie Hart: Yes, they do, JP. It's a good way to learn! Bike Friday (BF) is rapidly taking over from Boat Friday (BF) Ginnie. Ginnie Hart: Well, I don't know about that, Chad, but I'm glad there's more than one way to skin the cat. Well done. I had never seen these pedalless bikes until this summer. One of my grandchildren has one. Ginnie Hart: They're great for teaching the kids balance, Mary. I love seeing them in action. Like what Astrid said that the kids are taught speed and balance at a young age as well as to wear the helmet! Wonderful capture! Ginnie Hart: Exactly, Robin. I never saw it in America like I see it here. I love it. Ginnie Hart: Oh, yes, Anne. The whole package. Thanks. what a precious thing to find. i bet the rider was a cute fella, Ginnie. Ginnie Hart: I would have loved finding him/her, Ayush. Strange concept - you have to push it and it has a saddle. Not a lot of sitting can be done, except on a downhill, of which there are very few in the Netherlands. Great shot of new against the old. Ginnie Hart: You should watch their feet/legs fly, Louis. They have it down to a science. Ginnie Hart: So true, Martin. Ginnie Hart: I suppose your wee boys will be on one before long, G'pa?! Thanks. Ginnie Hart: Most kind of you, Tom. And now you know. A helmet is a good thing to see... here in the States it would be stolen. 10+ years ago, grandson N still used this type of little bike. Ginnie Hart: Actually, LC, I never saw one of these in America...not that I can ever remember. It's so very European! And I love it. The photograph looks positively ancient except for the bike and helmet. Ginnie Hart: Actually, that's how I feel about so much of Europe, Michael! Ginnie Hart: I see it all the time here in the Netherlands, Cherry.